Thanks to its 70 square km of ski domain, including 65km of pristine slopes and a large snow park, the picture perfect town of Valfréjus is a firm favourite with keen skiers and winter sports enthusiasts. 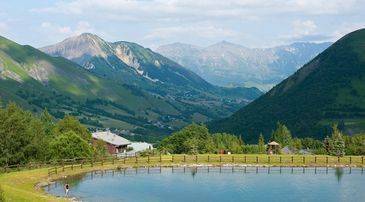 However, this resort, which is situated at a high altitude of between 1550 and 2737 metres, is also a wonderful choice for summer breaks. No matter what time of year you visit Valfréjus, you will find a dynamic atmosphere with a host of lively nightlife options and adventurous activities that every type of holidaymaker can enjoy. This mountain village is located in the dramatic landscape of the Thabor Massif. The highest peaks of this jaw-dropping area reach an altitude of 3178m and in parts the Massif is only 15 minutes from the Alps of Italy. 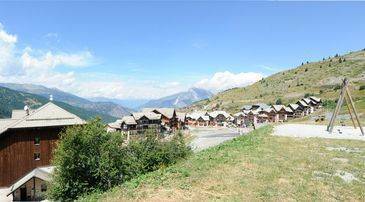 Vanoise National Park is known around the world for being an idyllic spot of natural beauty. This expansive park is located directly opposite the village of Valfréjus, so visitors will be treated to superb views of this and all the other natural scenery the resort has to offer during a stay. 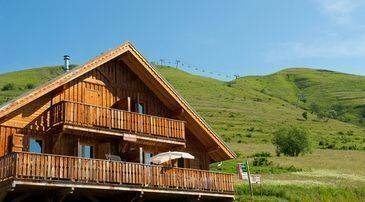 Spend your alpine holiday in our cosy apartments, Les Chalets du Thabor, each of which sleep up to eight guests and are situated less than 100m from the superb amenities of Valfréjus town centre. The French Alps have a rich cultural history dating back many centuries and nowhere is this fascinating heritage more proudly displayed than in the Savoie department of the Rhones Alpes, where Valfréjus is located. There is a range of day trips and activities on offer in the resort which celebrate the culture of the region. Valfréjus also offers more regular ways for tourists to enjoy the mountainous surroundings of the resort, with a number of walking and hiking routes available. Footpaths in the area range from gentle family friendly strolls in the sunshine to more daring and challenging uphill treks which can take up to a day to complete. Pay a visit to the local cheese factory to get a taste for the longstanding dairy traditions of the Alps and to see first-hand the process behind some of the cheese based local dishes that you are bound to enjoy during your stay. The Museobar Museum in neighbouring Modane is another exceptional way to discover the history and culture of the area. This quirky museum displays exhibitions which bring to life the traditional ways of life in Modane and Fourneaux including accurately recreated settings, modelled on 19th and early 20th century cafés. In the resort it is possible to purchase a weekly pass which permits access to a whole host of activities, including via ferrata and the Museobar. Other fun things to enjoy with or without the use of a summer activities pass include the two adventure parks of Valfréjus. Parc Aventure de Termingon and Parc Aventure du Diable both cater to all ages and involve exciting assault courses and climbing routes. The Ludo Parc is a fun filled water park complete with flumes, slides, and spacious swimming pools. The pass grants access to this park and many more. Dining in Valfréjus is an experience not to be missed. The resort has enough different eateries to keep even the most serious foodies well fed and thoroughly satisfied. There are three restaurants situated high on the mountain and a further six in the heart of the resort and the town centre, close to your Madame Vacances holiday property. Should you choose to treat yourself and the family to a meal at one of the luxurious mountainside restaurants, then make your way to the stunning Arrondaz Plateau. This popular dining area has an impressive altitude of 2200m and, as a result, the outdoor terraces of the local restaurants treat diners to incredible views for miles around. The three options for mountainside dining in the resort are La Bergerie, The Gourmandize and The Punra Bagna. Each of these eateries offers beautiful views, local delicacies and ambient bars. The nightlife options in Valfréjus are relaxed and fun, with a few après ski bars staying open throughout the summer. The Gourmand is the liveliest spot in the resort after dark, providing themed nights, cheap drinks and a welcoming international crowd. The live music venue, Le Malaysia, is another great option for wild nights out, while Le Cosy Bar is better suited to chilled-out evenings in a snug venue with friends and family. The resort of Valfréjus is connected to its neighbouring resorts and towns by over 300m worth of ski lifts. Many of these lifts, such as the ones connecting Valfréjus to Aussois, La Norma, Valcenis Vanoise and Bonneval Sur Arc, remain open during the summer. The best way to gain access to the lifts is to purchase an Eski Mo Ski Pass for the summer season. This pass permits use of the lifts as well as free run of the shuttle buses which operate between them. Valfréjus is an excellent choice for family holidays. As a result, there are plenty of childcare facilities located throughout the resort. These range from day care centres and clubs to private nanny services. There is a nursery in the centre of the village called Bebe Club Les Diablotins which welcomes smaller children between the ages of three months and three years. The covered car parks of the resort are only necessary for winter visitors who wish to protect their vehicles from the severe weather. If you visit Valfréjus during the summer you will find plenty of parking spaces on the streets of the town. It is important to check whether the available spaces are free to park in or whether there is a charge. Free spaces are clearly marked out on the maps which are available from the local tourist office.